"The case of Wagner recounted here, first completed in August 2008, collects fragments from handwritten notebooks kept in the years following Wagner’s death. The resulting manuscript is a poem of scenes and stories hinging on the day Wagner accidentally severed part of his finger as a child. The effects of this trauma echo across generations of Wagners as they migrate to America and quickly begin to absorb its disembodied soul." The Wagners will set itself inside you. Read it again and again, that is how things will go. “Once, he sat up in bed, shook with rage, and threatened to tell me something that I would not believe.” Oh I believe it and so will you! The Wagners is an elegiac meditation on the egregore. Or, rather, imagine this: a semi-omniscient entity takes notes to try & make sense of our lives. This is an intense multi-dimensional anthropological assessment, by way of memetic engineering & sociological investigation, by way of black magick & in-the-clouds prose. JOHN COLASACCO is the author of Antigolf (Civil Coping Mechanisms) and The Information Crusher (Spuyten Duyvil). ther work has appeared or is forthcoming in Hobart, Birdfeast, the NewerYork, LISE/ISLE, and The Iowa Review. Vote for EWDK in the Readers' Choice Award here. We’re offering 25% off his book to celebrate! We’re offering 25% off her book to celebrate! Join award-winning journalist and Fulbright scholar Anne Elizabeth Moore for a discussion about the insightful and timely essays found in her 2017 book, Body Horror. Body Horror explores the global toll of capitalism on women through painstaking research and surprising humor in essays that range from probing journalistic investigations to deeply personal narratives. Featuring illustrations by Xander Marro, Body Horror is a fascinating and revealing portrait of the gore of contemporary American culture and politics. Writers, artists, and lovers of comics and graphic novels can warm up from their winter blues at this public workshop for ages 6+. Tickets are going fast. Snag yours and learn more about 826CHI here. "Ultimately, Mazza’s work is impactful not because it aims to answer questions, but rather because it raises more." Charlatan charts the development of a dynamic body of fiction by a writer due for discovery by millennial readers unsatisfied by mainstream feminism. Read more and order your copy here. "Indeed, Wilking’s fine book is an ideal read for anyone looking to study not only the natural world, but the mycology of the human mind: the lethal, the surprising, the wondrous." During the height of the AIDS epidemic, poisonous mushrooms and the death of acclaimed choreographer Haze Morton bring together his partner, his lover, and a reclusive artist. Each of them come to understand the ways in which their lives have crossed because of Haze, and how they can begin living again, together. Looking for a great book to kick off the new year? We've compiled a new 2018 catalogue to help you start off the year on the right literary foot. From shorts stories, to novels and memoirs, to poetry and art, we've got just the right book to keep you company while you stay warm this winter. Access the catalog here for sneak peeks at what's in store for 2018. Featured titles include: Dear Abigail and Other Stories by Stephen Dixon, Perfect Conditions by Vanessa Blakeslee, The Hypothetical Man by Paul Maliszewski, and Defying the Verdict: My Bipolar Life by Charita Cole Brown. Drop by the store or order online today! The third annual Wild Onion Novella Contest is officially closed! Thank you again to Tim Kinsella who will be judging this round of manuscripts. And, of course, thank you to everyone who dug through their hard drive, combed through their journals, or even dusted off their typewriter. We couldn't be more excited to start reading your work! Keep an eye on your submittable account and the Curbside website for updates. Do you still have holiday shopping to do? Order by Monday, December 18th and we'll guarantee delivery by Christmas day. Still not enough incentive? Use the code GIVEBOOKS20 and get 20% off from our online store. Save money, get the perfect gift, AND support local businesses at the same time? It's almost too good to be true. Is "become an author" on your 2018 New Year's resolutions list? If so, then we have the perfect opportunity for you! The Third Annual Wild Onion Novella Contest is accepting submissions until December 31st. Curbside Splendor is thrilled to have Tim Kinsella as our guest judge this year. So if you have a novella that you've been dying to share with the world make sure you get it in before the ball drops! We're really proud that Body Horror snagged a spot on this list as a good gift for the Person Whose Interests Skew Morbid. Don't worry if that's not your style because even the list curator said it's funny, she swears! Chicago Public Library recommends Body Horror as one of the Best Books of 2017. We are officially in the midst of the holiday season. What's a better gift for your friend who never goes anywhere without something to read than one of the best books of the year? We've got two great events happening tonight— make sure to join us at one of them! Good luck choosing. Join us tonight at 7 PM for a reading by Kevin Coval from his book, A People's History of Chicago. Come out to Curbside Books & Records and celebrate the Windy City with the man who The Chicago Tribune named "the voice of the new Chicago." Tonight at 6:30 PM the Writer's Studio at the University of Chicago Graham School is hosting an open mic of Chicago writing. The event will include a reading by some of the contributors to the anthology and open mic readings about Chicago. The open mic registration list is full but registration for the waitlist is still open. Drumroll, please! 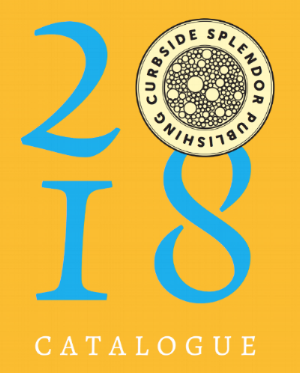 The Chicago Review of Books Awards (Chirbys) went out last Friday and we’re proud to say Curbside was well represented. Both Revise the Psalm edited by Quraysh Ali Lansana and Sandra Jackson-Opoku and Body Horror by Ann Elizabeth Moore placed in this year’s Best Creative Non-Fiction category. A special shout out to Megan Stielstra who won the category with her new book The Wrong Way to Save Your Life from Harper Perennial. Make sure you also check out her earlier book Once I Was Cool and browse through the Chirby list. Congratulations to all of the recipients and nominees! It’s an especially good time to be a Chicagoan. Good news for all you procrastinators— The Wild Onion Novella Contest has been extended! We will be taking submissions until December 31st on our submittable page. Get a head start on your New Year’s resolutions and start the year off right by getting your manuscript published. The Wild Onion Novella Contest will be judged by musician Tim Kinsella, author of Let Go and Go On and On and The Karaoke Singer’s Guide to Self-Defense.